Over 90% of flowering plants rely on insect pollinators for sexual reproduction. Pollination biologists often quantify pollinator effectiveness by counting the number of pollen grains a pollinator deposits on a plant’s stigma in a single visit. However, flowers in the Asteraceae, like Echinacea, are uniovulate, meaning that a there is just one ovule per style. 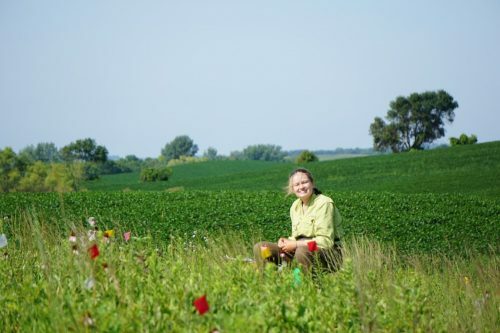 Therefore, it theoretically only takes one viable pollen grain to fully set seed in an Echinacea ovary, which means the standard method of quantifying pollinator effectiveness may not be appropriate for Echinacea and other members of the Asteraceae. In this study, we wanted to estimate how many pollen grains are really necessary to set a seed in Echinacea angustifolia. We performed 60 hand crosses with varying levels of pollen deposited. Each cross consisted of nine total styles of which three were removed before the cross to get estimates of self-pollen deposition, and six styles were crossed with pollen from other flowering individuals. We then collected styles and stained them using fuchsin gel and to count the number of pollen grains using a compound microscope. We x-rayed the achenes, fruits, from the crosses to determine if a seed was present. Preliminary data shows that seed set varies with the pollen grains deposited. These data will advance our understanding of pollinator effectiveness in this uniovulate plant. By increasing our understanding of pollinator efficiency in the Asteraceae we can better predict the consequences of pollinator declines in fragmented habitats, such as the North American tallgrass prairie. Physical specimens: 183 Echinacea heads were dissected at the College of Wooster in fall 2018. They are currently being processed at CBG. Team members who have worked on this project include: Mia Stevens (2018) is the lead on this project.